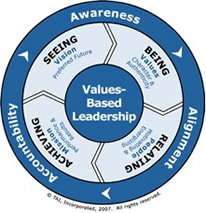 As an afterthought, a friend of mine made this good point on Facebook about values-based leadership: It exhibits the same magical thinking as speech-acts and ritual practice: If we *say* it is so, it *is* so. Then we can just go about our business, and if anybody points out a discrepancy between actions and values, values win. That is almost a Jedi Mind Trick. I’ve commented on something similar to this based on experiences from previous work places: http://blog.blazingangles.net/soapbox/2008/03/arbejdspladsens-vaerdier.html. Hello wolf… very good discussion for Scandinavian speakers! Level-headed and more constructive than my own.